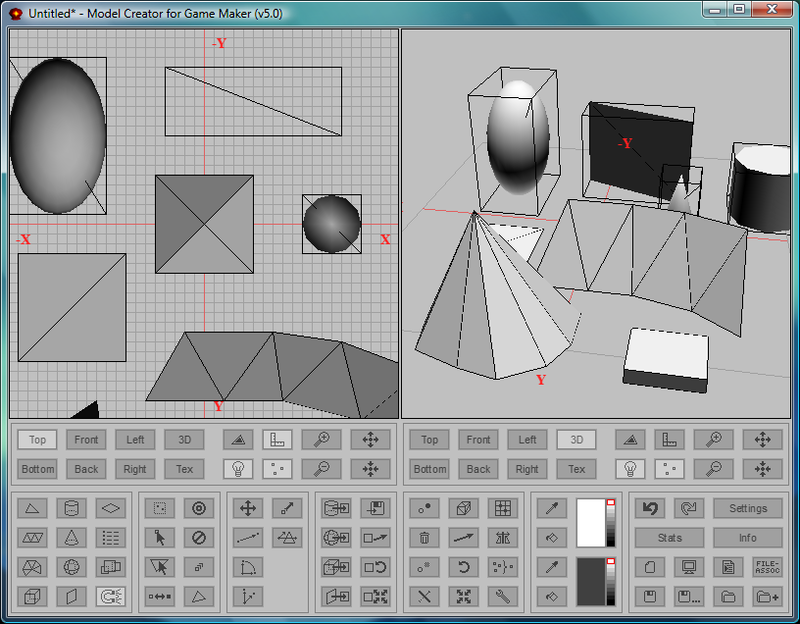 Model Creator For Game Maker - V5.0 - Open Source! Model Creator v5 is now open source! I am not planning to make any changes to the program anymore (not in v5 at least). Model Creator v5 by Maarten Baert is licensed under the Creative Commons Attribution-Share Alike 2.0 Belgium License. If you want to redistribute the original or modified versions of Model Creator v5, you must include my name (Maarten Baert) and a link to http://www.maartenba.../model-creator/ (or the url itself). This program allows you to create 3D models for Game Maker. This is not the first version, it's just the first time I created a topic for it on this forum. Older versions can be found on the Dutch GMC: link. If you have no idea how to start, it is a good idea to watch these first. This is a screenshot of the main program. It shows the entire menu and two views. The program is a lot easier to use than most professional modeling programs. It is designed for creating low-poly models (<1000 triangles) as Game Maker would slow down anyway if you tried to use models that are too complicated. However, it is perfectly possible to create high-poly models with it as well. You can put this in your signature if you like the program. Edited by Maarten Baert, 25 May 2013 - 02:27 PM. Looks interesting and I've been meaning to learn some sort of model program (not to mention learning how to put models in my game in the first place). I'll give it a try. Edited by Digiboy, 05 January 2009 - 09:51 PM. Finally someone has made a professional 3d modeling program specifically for gamemaker. I can give up on animor8 now and use your program to make all my models from now on. Being able to color individual faces is awesome iv'e been waiting along time for a program that allowed it. From my short playtest it seems just about perfect there where no errors or bad design choices at all. I love you ! Thats all I have to say. Edited by Pie Person!, 06 January 2009 - 10:08 PM. Perfect! Just curious, how long did it take you to make this?? This version took about four months, but I made the first version more than a year ago. Dude, I hope to use this for my first 3d game (Well 2nd really), thanks. this is awesome, and has a nice professional feel to it! it would be even better if you could export as a GML script! i found it bit hard to get make what you want, is there a way to reverse faces? Edited by grumpymonkey, 08 January 2009 - 10:21 PM. Yes there is. Select the face and click the 'reverse face' button . I really like this, I tried making models with another program and exporting them as an .obj and loading them with a script a guy made and that was really hard to get working in game. However if yours does what it says it does then this should make things a lot easier. Are the right and middle mouse buttons being used to do anything? Because one thing one thing I would really, really like to be added is that pressing them would allows you to rotate the view, without having to select "move view", then left click to move it, then unselect "move view" to continue working. There is a shortkey for rotating the view . The middle mouse button is not used because lots of people don't have a middle mouse button. But maybe I will change this so you can rotate the view with the middle mouse button. The scroll wheel is used to change the Z value. The right mouse button is used to cancel most actions. ill be watching you closely! I`ll have to properly check this out when I get a chance. I`ve been using 3DSMax for low poly work for years & know it like the back of my hand.. I have high hopes that this may be the perfect solution! does it work well with vista? Yes. I did almost all the testing on windows vista. I'll like it. Its a little hard to get used to be it is and will be very useful. Its a bit confusing though. I added orbiting with middle mouse button and zooming with scroll wheel. Also, vector transformations should work in the texture editor now. Can you make animations with this? Also, can you angle different polygons? If not then that would be nice to add in. Perhaps you should make some tutorials. The videos help a bit but just watching how you very quickly made a model doesn't help as much as it could. I've been trying to figure out texture mapping but just going by your video, I can't get cubic mapping to work. Also, how do the color buttons work? I've been trying to figure it out but to no avail. Yes I have read the documentation but it didn't explain every question I may have had. Better explanation of the coloring buttons. Dang, this was such a cool program. i made a figure i gonna post soon. This looks like a nice 3d model editor/creator. it looks like it's very well done, except it looks like it takes way too many steps to do a simple task. vertex editing is good, but not so much entirely vertex modeling. - rotating basic shapes: Because of a limitation in the GM model system this is not possible. Models don't support transformations. - wings3D: I will have a look at it. - error: Someone else had discovered that error already. It is fixed in the current version of Model Creator. - poly-by-poly modeling: Yes, this is possible. This is why I made this program. I couldn't find any program that allows me to create polygons this way. - color buttons: you can click the colored rectangle to change the color. Select something, then click the 'apply color' button to apply the color to the selected faces. It is not possible to change the color of basic shaptes (limitation in Game Maker, again). Basic shapes will always use the color set by draw_set_color (in your game). - adding windows: I think the easiest way to add windows is to use a wall texture with a window (with alpha if you want transparent windows) and tile it on the wall. Edited by matrebatre, 16 January 2009 - 08:49 PM. Very good program, I didn't know such programs can be made with GM! But I think, that in the future, I will use this program, as it seems really nice and comfortable comparing to other programs I saw, and it 100% does models that will work on GM. I'm rating this 5/5 for sure! Texturing only works on triangles. But this is a really nice application, good work, this can replace anim8or. Only on triangles...that would explain my troubles. Holy crap! Finally! Thank you! Game Widgets - Your pure-GML solution to API DLLs. Featured in Markup Magazine! Moved away from the forum - e-mail me if you need quick contact (hi_146@hotmail.com). -extrude would be very useful! been trying to figure this out for a while now, Thanks! Edited by sk8erace1, 24 January 2009 - 07:52 AM. edit: OMG just noticed the re sizable grid this is what was missing in the first version Thank You! Edited by sk8erace1, 24 January 2009 - 09:53 AM. I uploaded a new version. The bugs are fixed now. - Real multitexturing is not possible in GM. But you can generate textures (backgrounds) at game start, maybe it is possible that way. - 'resize faces uniformly': what do you mean? If you use the same values for x,y,z , the scaling is uniform. - currently you can only turn lighting on or off. Why do you need less powerful lighting? - "by the way how do you get the vertexes from a model when loading the models": do you mean the loading script? It is not that hard, the model file is almost identical to GML. It uses numbers instead of function names. - Texture mapping is only possible for triangles because basic shapes don't support texture coordinates (only texture repeat). You should convert the basic shape to triangles first. i noticed the scaling thing after I'de posted that anyways a plugin system would be great would you release it to public so that they could make their own plugins? edit: sweet subdivision would be nice as well! also whats 'projection mapping' is that just basically saying it unwraps the model based on its projection? btw what does this mean exactly? "- Uses my calculator DLL for all user input (you can use expressions)"
Edited by sk8erace1, 25 January 2009 - 01:31 AM. You can convert your other shapes to triangles before texturing or flipping faces. And is it possible to add a point that you can connect to the other vertex point (or something like that)? This is... awesome! I never really took the time to learn how to use the 'professional' modeling tools properly, and so I just never really got into 3D... but this simplifies things by so much compared to other tools! You should make your own forums for this (I don't mean this thread, I mean using something like InvisionFree), so others can post their own methods, models made from it, and other things. I bet it would be pretty popular. Just a quick question- Is it possible to merge the objects, so I don't have to edit the texture to make it look like there's one texture wrapping around the whole thing? I know that the built-in shapes (block, cylinder, ellipsoid, etc) are treated as separate objects, but when I convert them to triangles they are still not treated as being part of the main part of the model. Edited by xGamerZx, 29 January 2009 - 07:59 PM. - The plug-in system will use GML. I don't know yet whether the plug-in system will be public or not, because it is a security risk. - There are some DLL's that can handle 3D collisions and can load GM models. Try to use one of these, it is a lot faster. - Projection mapping projects the vertex coordinates on a plane and uses these coordinate for the texture coordinates. - When you convert a basic shape to triangles, the triangles are identical to the other triangles in your model. - I will try to make a 'replicator' plug-in that allows you to create multiple copies and translate/rotate them. It supports all the math functions in GM. 4) have people submit plugin code to you for approval or something then you can encrypt and give it back that way only you know how to decrypt it if using strong encryption password etc this would be alot of work depending on how many are submited probably very few if any..
i wouldn't mind this method much though you might. Edited by sk8erace1, 01 February 2009 - 09:57 AM. This is simply amazing, I never knew Game Maker was capable of this. It's just like MilkShape without the huge export list. 8.5/10, Considering 3D is usually harder than 2D. this is just so amazing and simple! thank you LOADS! for this amazing app! I was bored and decided to make a video of me making a table model in your model creator. Read the previous page . a simple, effective animating program made with game maker. Programming with Game Maker since version 5. I've moved onto AS3 and XNA, but i remain a GM user to the heart. Oh, wow! This sounds very good and the screenshots look great! Edited by sk8erace1, 06 February 2009 - 11:06 AM.